When the Chicago Cubs acquired Aroldis Chapman from the Yankees in late July this past baseball season, experts saw that move as the last acquisition that would make the Cubs the prohibitive favorite as the 2016 season was pushing to a close. Pundits saw Chapman as the shutdown closer the Cubs needed and a pitcher who could give the Cubs a save whenever they would need one for the rest of the season, and more importantly, saves in the post-season. For the most part, Chapman fulfilled that promise. However, with a 6-3 lead in the bottom of the eighth inning in the seventh game of the World Series, the unexpected happened: Chapman blew the save. 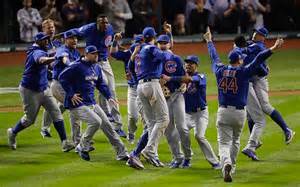 Fortunately for the Cubs, they were able to regroup and win Game 7 and the World Series in extra innings. The line score for that game, however, showed Chapman as the winning pitcher and Mike Montgomery with the save for the Cubs. Montgomery’s save for the Cubs in Game 7 of the 2016 World Series was only the 14th Game 7 of the World Series save in history. It was also the only Game 7 of the World Series save to happen in extra innings. Montgomery only faced one batter for his save. It was the third time in Game 7 of the World Series that a save occurred with a pitcher facing only one batter. The other times: Darold Knowles in 1973 for the Oakland A’s and Bill Hallahan in 1931 for the St. Louis Cardinals. The save for Montgomery was the first of his career, post-season or regular season. Knowles had 143 career regular season saves and had two save sin the ’73 World Series. The 1973 World Series was his only World Series. Hallahan had seven career saves; he made four World Series appearances… the ’31 save in Game 7 was his only World Series save. Of the 14 Game 7 of the World Series saves, three were less than an inning, five were one inning, 1 1/3 inning or 1 2/3 innings, six were saves of two innings or more. Montgomery became one of 16 pitchers to get a one-batter save in any World Series game. His was the first since Mark Buehrle did it in the 2005 World Series for the Chicago White Sox in Game 3 versus the Houston Astros. In addition to Montgomery’s Game 7 save, Chapman had a save for the Cubs in Game 5. Two different pitchers for the same team with a save in a World Series this year was the first since the White Sox did it in 2005 with Buehrle and Bobby Jenks.